and have floors covered with tatami mats. Tatami is derived from a verb tatamu which means to fold or to pile. It shows us that the original tatami was used in different way. the oldest history book in Japan written in 712. In olden times tatami were used only by high status people. which were used as isolated pieces in the Heian period (794 - 1191). 3: Only one half size tatami should be used per room. These arrangements are for auspicious ceremonies. There size of the tatami depends on the area it's found in. comlpex size which has become available. incense burner or etc. on the raised platform. and it's the size of a quarter or a half or full sized tatami. The room with the tokonoma is the most important and formal room in a house. 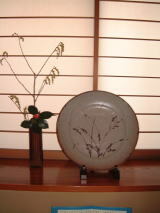 Even today there are lots of houses with a tokonoma in a Japanese-style room. 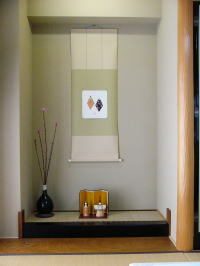 A decorative corner pillar is called a tokobashira. It is usually made of specialy shaped and polished wood. and the shadows it casts are enjoyable.